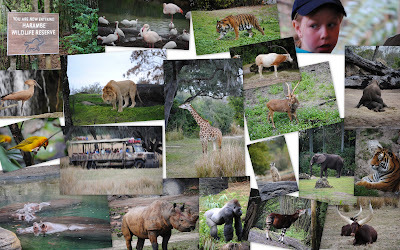 The final day of our vacation we ventured out to Disney's Animal Kingdom - it was awesome! Our first ride was a safari ride though the plains of Africa. We got to see many animals on our ride - it was better than any zoo we've ever been to! The animals were active and nice and close (well, not too close!) We then explored some walking trails of African and Asian animals. The kids loved being able to see so many, especially lions, tigers, and giraffes! We also enjoyed exploring around the Africa and Asia villages - everything was so detailed you really did fee that you were in another country. Nathan was the only brave soul to ride the Expedition Everest roller coaster though! That's the Expedition Everest coaster in the back. Finally our day ended with meeting Goofy, Pluto, Donald Duck, Minnie Mouse and Baloo and King Louie (from the Jungle Book movie.) The kids had a great time and we wish we could have stayed longer! It was a fabulous trip - exhausting, but very fun. We can see why people visit Disney every year. We are already looking forward to our next trip!! Day 3 was spent at Epcot. We enjoyed some thrill rides like Mission: Space and Test Track and also more mellow ones like Nemo and Friends. We got to meet even more Disney characters: Pocahontas, Chip&Dale, Belle, and Snow White. We had lunch in the Germany section of the World Showcase at a Biergarten - having been to real biergartens in Germany we found this to be quite authentic even down to the band (with accordion player) that played during lunch. J enjoyed the fire truck to climb on as well as the game where you look for fire hazards in a house. Day 2 started early again this time the first stop was a character breakfast buffet where we got to meet and greet Mary Poppins, Alice, the Mad Hatter, and Tigger and Pooh. After breakfast we headed over to the Magic Kingdom. Knowing our way around a bit more we were able to hit all the rides/attractions we wanted to see very easily, but albeit a bit more slowly today. A highlight was the Ariel meet and greet as well as The Little Mermaid ride. We took some time to enjoy an ice cream snack before the afternoon parade and happened upon a different parade involving Joe Flacco (the Superbowl MVP and winning Quarterback.) I guess when they say the are going to Disney World they really mean it! Even the ice cream sundaes have Mickey ears! Our Magic Kingdom experience ended with meeting Cinderella, Aurora (Sleeping Beauty) and Rapunzel. Each time we met a princess J's mouth was wide open in awe - it was so precious! Finally our day ended with a dip in the (warm!) pool back at the hotel. Chilly outside, but warm in the water and the kids had a blast! We were able to take a family vacation to Walt Disney World recently! We had a great time and were accompanied by S and J's Grandma and Grandpa! We took 971 photos over our 4 days! don't worry I'm not posting all of them! Just a few highlights from each day! The 1st day we ventured to Magic Kingdom. We spent 12 long hours there and had an absolute blast. We first rode the Dumbo ride, which was the one J was looking forward to the most. One of our favorite family rides was the Buzz Lightyear ride, which we did twice. The kids were also happy to get to meet Buzz! The kids got to meet and greet several characters during their visit. Today we saw Woody, Jessie, and Buzz Lightyear (from Toy Story,) Peter Pan, Pooh, Tigger, Piglet, Eeyore, and Mickey Mouse! Tigger is J's very bestest tiger friend!